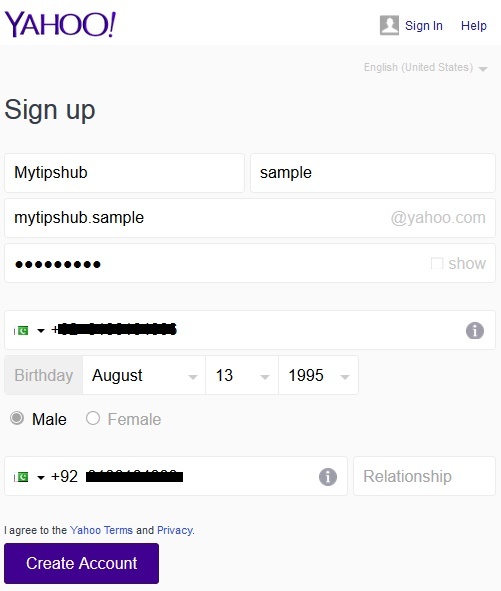 In my last article, I shared a beginner guide on how to create a Gmail account and now in this article, I am going to show you how to signup for Yahoo email a/c. As I mentioned in the last post how important it is to set up an email address for taking advantages from various services, with Yahoo mail, you can utilize it to get maximum out of it. Registering to any email service provider is very easy and steps are so simple. Anyone can easily understand and register their email, we create this article for helping beginners and for those who don’t know how to do this. Open www.yahoo.com or www.ymail.com in your web browser and click on Signup. A form will appear, enter your info like such as the first name, last name, your desired email address, password, DOB, phone number, etc. You should use a powerful password. Then click on Create Account Button. In the next step, Yahoo will request to enter captcha text to verify that you’re not a bot. Enter captcha text and click on Submit Button. After submitting code, a message will appear like “Your account has been successfully created” and you will be redirected to yahoo homepage after few seconds. Congrats, your email address is just created. So, readers, this is very simple to create a Yahoo email address. You can register your email address in any email service provider by following these instructions because steps are almost the same with everyone. If you have any problem in account registration feel free to write in comment section we will try to help you.